Flow cytometric analysis of HeLa cells using Ubiquityl-Histone H2B (Lys120) (D11) XP® Rabbit mAb (PE Conjugate) (blue) compared to concentration-matched Rabbit (DA1E) mAb IgG XP® Isotype Control (PE Conjugate) #5742 (red). 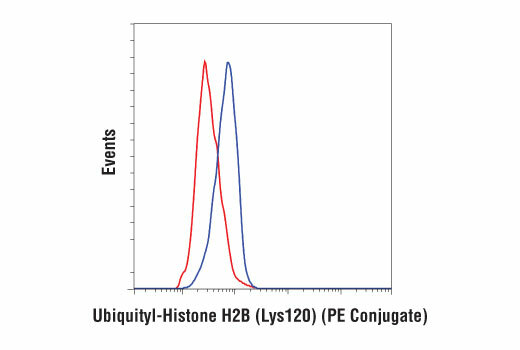 Ubiquityl-Histone H2B (Lys120) (D11) XP® Rabbit mAb (PE Conjugate) detects endogenous levels of histone H2B protein only when ubiquitylated on Lys120. The antibody does not cross-react with other ubiquitylated proteins or free ubiquitin. Monoclonal antibody is produced by immunizing animals with a synthetic peptide corresponding to the carboxy terminus of the human histone H2B protein in which Lys120 is mono-ubiquitylated. This Cell Signaling Technology antibody is conjugated to phycoerythrin (PE) and tested in-house for direct flow cytometry analysis in human cells. This antibody is expected to exhibit the same species cross-reactivity as the unconjugated Ubiquityl-Histone H2B (Lys120) (D11) XP® Rabbit mAb #5546. The nucleosome, made up of four core histone proteins (H2A, H2B, H3 and H4), is the primary building block of chromatin. Originally thought to function as a static scaffold for DNA packaging, histones have now been shown to be dynamic proteins, undergoing multiple types of post-translational modifications, including acetylation, phosphorylation, methylation, and ubiquitylation (1). Ubiquitin is a conserved 76 amino acid peptide unit that can be covalently linked to many cellular proteins by the ubiquitylation process. Three components are involved in this protein-ubiquitin conjugation process. Ubiquitin is first activated by forming a thiolester complex with the activation component E1; the activated ubiquitin is subsequently transferred to the ubiquitin-carrier protein E2, then from E2 to ubiquitin ligase E3 for final delivery to the epsilon-NH2 of the target protein lysine residue (2). Histone H2B is mono-ubiquitylated on lysine 120 during transcriptional activation by the RAD6 E2 protein in conjunction with the BRE1A/BRE1B E3 ligase (also known as RNF20/RNF40) (3). The RAD6/BRE1 complex is recruited to gene promoters during activation by the PAF complex, an RNA polymerase II-associated protein complex that regulates transcriptional elongation (3-5). Mono-ubiquitylated histone H2B lysine 120 is associated with the transcribed region of active genes (3,6). Mono-ubiquitylation of histone H2B stimulates transcriptional elongation by facilitating FACT-dependent chromatin remodeling (7,8). In addition, it is essential for subsequent methylation of histone H3 lysines 4 and 79, two additional histone modifications that regulate transcriptional initiation and elongation (9). Interestingly, de-ubiquitylation of histone H2B lysine 120 by USP22, a subunit of the human SAGA histone acetyltransferase complex, is a required step in transcriptional activation (10). Thus, it appears that the ubiquitylation state of histone H2B is dynamic during transcription and may serve as an intermediate step in transcriptional activation. Liu, F. and Walters, K.J. (2010) Trends Biochem Sci 35, 352-60. Kim, J. et al. (2009) Cell 137, 459-71. Wood, A. et al. (2003) J Biol Chem 278, 34739-42. Xiao, T. et al. (2005) Mol Cell Biol 25, 637-51. Minsky, N. et al. (2008) Nat Cell Biol 10, 483-8. Pavri, R. et al. (2006) Cell 125, 703-17. Fleming, A.B. et al. (2008) Mol Cell 31, 57-66. Shilatifard, A. (2006) Annu Rev Biochem 75, 243-69. Wyce, A. et al. (2004) Novartis Found Symp 259, 63-73; discussion 73-7, 163-9.